There may be cases in which you need to boot to a secondary hard drive on your Mac, either to recover a drive, install a new OS or restore some software. Either way, the easiest way to do this on Apple computers is to hold down the “Option” key while booting up your system; however, there may be some constraints. On portable Macs, you can start up or reboot your Mac, and simply hold the “Option” key once the screen goes black so that when it reboots it will show you the boot menu. However, this process is a little more specific on Macs that use a Bluetooth keyboard. If you hold down the key before the Bluetooth keyboard and your Mac boots, your system will prevent it from recognizing the key as pressed. Bluetooth keyboards only start up once the boot chimes sound. To ensure that your Mac goes to the boot menu, only press and hold the “Option” key immediately after hearing your Mac boot sound, not before. When you’ve opened the boot menu properly, a gray screen will display that will show the available boot volumes, similar to the one above. 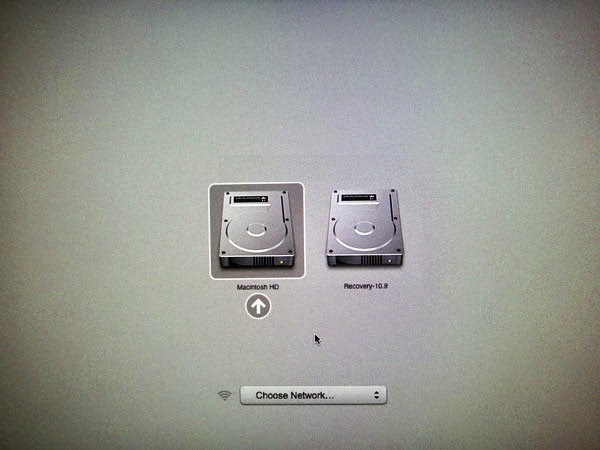 If your system is running OS X 10.7 Lion or later, you’ll see the default Macintosh HD partition alongside a Recovery HD volume. However, for systems running 10.6 or earlier, you’ll only see the main boot volume. If you want to boot using a different drive, you can simply attach an external hard drive, flash drive, or an optical disk that contains valid operating systems and when recognized they should appear alongside the current boot options. Once your drive appears on screen, you can easily boot to the desired disk by selecting with your mouse and clicking the arrow button. Alternatively, you can use the arrow keys to navigate the menu, and then press “Enter” to select the desired volume. Additionally, if your Mac shipped with an optical drive, you can simply boot to a disk in the drive by holding down the “C” key at startup. This “C” key method works both for Macs with CD drives as well as for Macs with DVD drives included. And if you want to use an external USB DVD drive to insert a boot DVD and run it, simply connect it via USB, and the drive should appear in the standard boot menu for access. If your system runs OS X 10.7 or later, you can also boot directly to the recovery drive by holding “Command + R” on startup. Also, most systems shipped after 2010 support Internet Recovery. This can be invoked by holding “Option + Command + R”. The Internet Recovery method will require an Internet connection through which it will download a 650MB recovery image file from Apple. Note: You should know that selecting an alternative boot disk will only be set for the current boot session. If you want to permanently select a different startup disk in OS X, use the Startup Disk settings that are available in System Preferences.